When the Cosco Busan container ship hit the San Francisco Bay Bridge and leaked 53,569 gallons of bunker fuel, Matter of Trust came out to the beaches with hair mats (made from human hair clippings) to soak up the oil coming ashore. Joining forces with the surfers who called themselves Kill the Spill, we managed to sort out the Tyvek suits and gloves, collecting a pile of pure oily hair mats. Matter of Trust then orchestrated a treatability study for composting hazardous waste oil collected in hair mats. 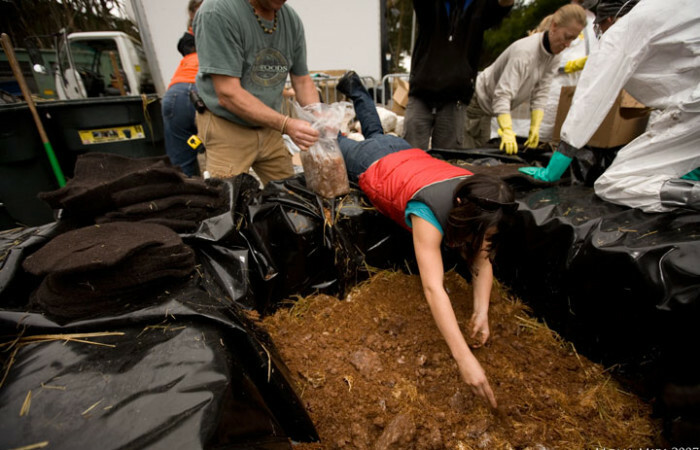 The Presidio of San Francisco provided us with a space to conduct the remediation study and Paul Stamets of Fungi.com donated $10,000 of oyster mushroom spawn and expertise to the first phase of the project. Bunker fuel is almost a tar and very hard to remediate. After several months, we knew we would need to use a multipronged approach to this problem. As in nature with intertwining ecological cycles, there is seldom a silver bullet. So we met with UC Berkeley experts on thermophilic long row composting. Huge thanks also go out to Ken Litchfield of the Mycological Society of San Francisco. Conclusion: This is a labor of love. We believe this is a worthwhile and empowering solution to the people in the Amazon who had left the place for decades when there were oil pits that resulted from pipeline leak debris. For shoreline cities with little landfill space or time, this is impractical and hazardous waste is better incinerated for energy in a closed system that takes care of particulates.